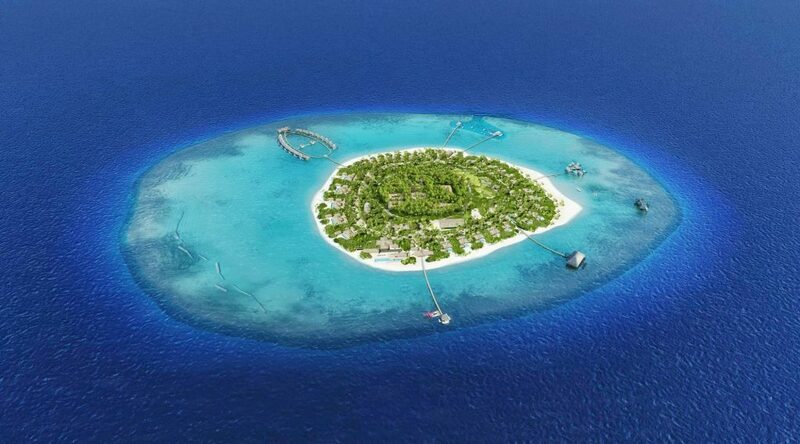 Velaa Private Island is the realization of a dream to create a ‘beyond luxury’ exclusive boutique hideaway. This unique destination was developed to embody the very best of this unique archipelago, bathed by azure skies in the aquamarine waters of the Indian Ocean. 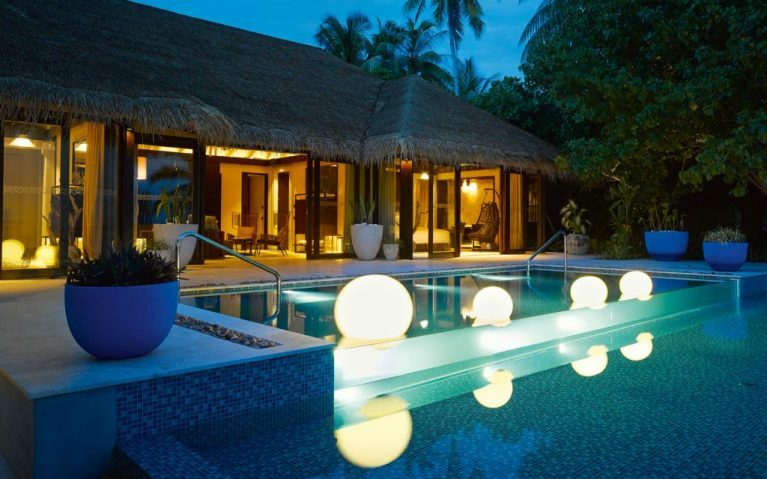 Located in the gorgeous Noonu Atoll, 187 kilometers north of Male, Velaa Private Island is an exceptional luxury retreat where our guests are treated like royalty. 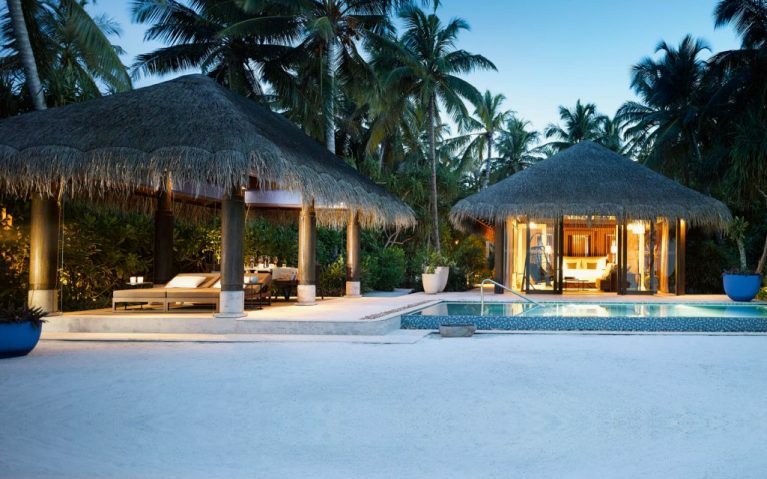 Velaa Private Island has been designed and curated with privacy and comfort as the guiding principles while allowing the Indian Ocean to take center stage. At one with nature, each of the private retreats is built using local materials, combining contemporary flourishes with interiors designed for sensory exploration. Velaa Private Island shares its name and its home with the generations of sea turtles that have inhabited the island for countless years. The colors and patterns of a turtle shell make up subtle nuances in the design, while from a broader aerial view, Velaa’s exclusive over-water villas resemble the head of a turtle with the island forming the body. 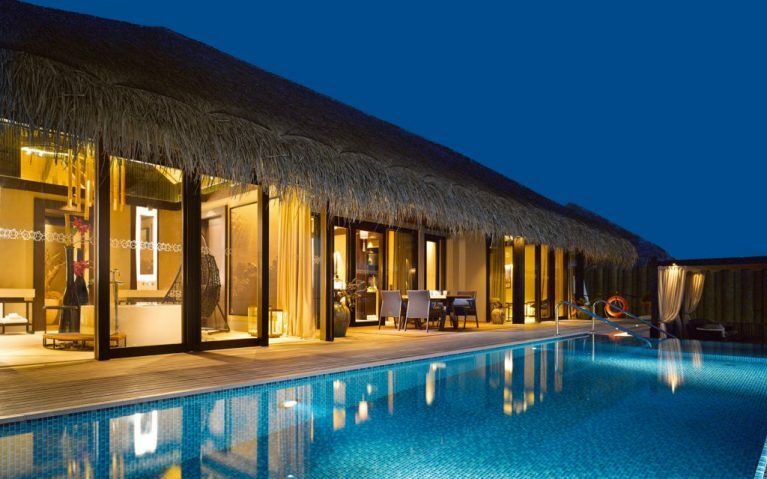 Designed by Czech architect Petr Kolar, the overall design concept is contemporary, yet intimate, with Maldivian nuances. Seaplane Transfers are available during day light only 6 Am to 3 Pm. Please double check your flights arrival & departure timings prior to confirming Booking. An Invitation to immerse yourself in deep relaxation and rediscover your inner peace and spiritual well-being. Offering the ultimate personalized experiences, our Spa can create a unique programme for the duration of your stay. Embracing a holistic approach to wellness, the Spa also offers a selection of Asian-inspired therapies including Ayurveda, Yoga and Meditation to enhance and promote health and longevity. Spa boutique showcases various lifestyle products, allowing you to continue your spa experience in the comfort of your home. 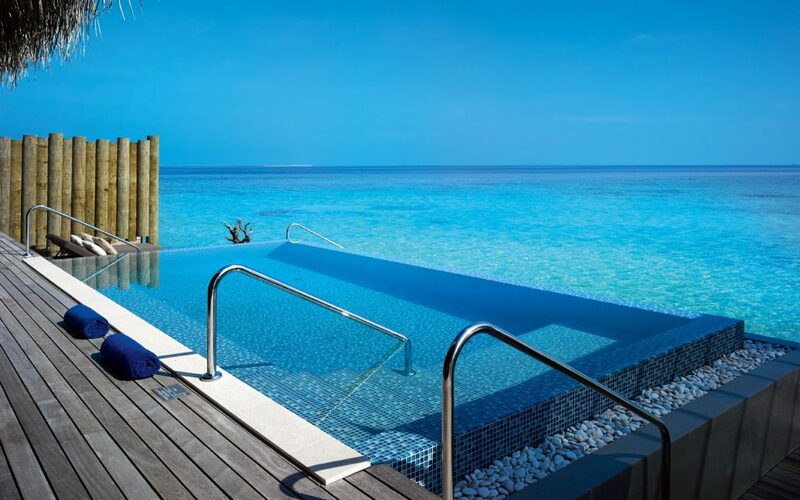 Discover paradise within a paradise, where a world of renewal awaits your arrival. 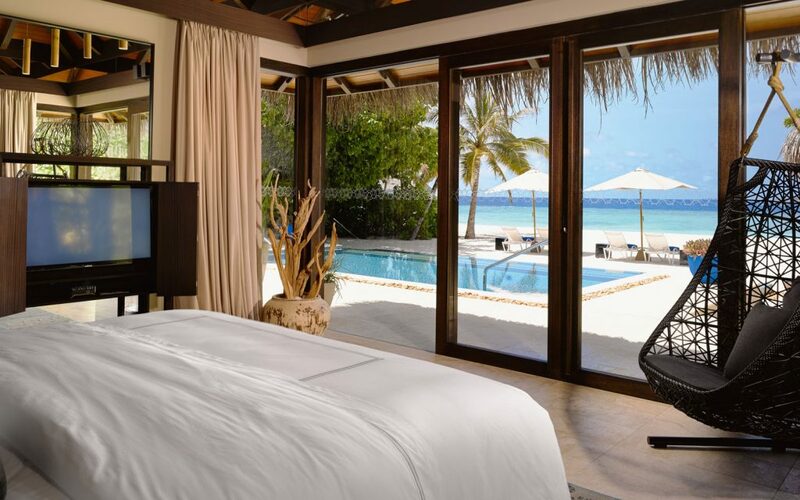 Beach Pool Villa – Detached one-bedroom beach front villas are sumptuously furnished. Mahogany louvered panels and intricate lofty ceilings impart a colonial feel, while teak furniture and suspended bamboo lights bring nature indoors. Wall to wall glass doors frame the terrace and private pool. By day the villas are filled with light, yet remain secluded by clusters of palms. An indoor bathroom with Romeo and Juliet basins opens onto a large outdoor bathroom connected by a garden atrium where a gazebo covered daybed overlooks the oversized tub. Day beds, swinging chairs and an alfresco dining area face the Indian Ocean. Minibar, Shower, Bath, Safety Deposit Box, Telephone, Air conditioning, Hairdryer, Hot Tub, Kitchenette, Bathrobe, Radio, Refrigerator, Desk, Seating Area, Free toiletries, Fan, Toilet, Bathroom, Slippers, Satellite Channels, Laptop safe, Flat-screen TV, Sofa, Electric kettle, iPod dock, Private pool, Wardrobe/Closet, Bidet, iPad, Sea view, Hypoallergenic, Coffee machine, Terrace, Towels, Linen, Outdoor furniture, Outdoor dining area, Clothes rack. 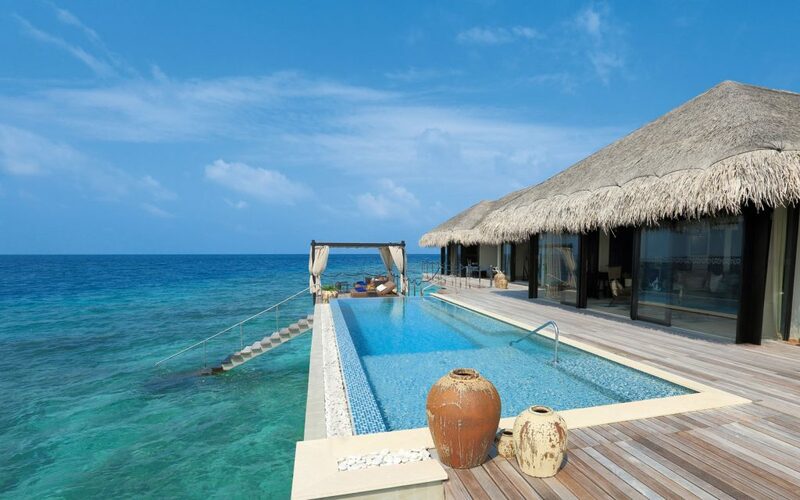 Along an extended jetty, the villas on this crescent have uninterrupted views of the ocean and private pools. Overhanging thatch offers shade over the dining area, while the bedroom and bathroom open onto the terrace, pool and sun deck, with steps leading alluringly into the ocean. Inside, the comfortable living room is designed around a viewing window set into the floor, while the bed faces the ocean. In lush foliage flanked by gently swaying palms, the two-bedroom beachfront houses are ideal for families. The large living area works as a retreat in the day and a social hub in the evening. It leads to the kitchen area, complete with bar and high stools, which is practical for both catering and socializing over snacks and meals. Prestigiously located on the tip of the island, in an exclusive private domain, this two-bedroom over water residence fringed with traditional thatch offers an elegant living space with carefully curated elements. Louvered shutters let the breeze flow through, while a deep sofa is covered in scatter cushions, ideal for settling down with a good book. Minibar, Shower, Bath, Safety Deposit Box, Telephone, Air conditioning, Hairdryer, Hot Tub, Kitchenette, Bathrobe, Spa Bath, Radio, Refrigerator, Desk, Seating Area, Free toiletries, Fan, Toilet, Bathroom, Dressing Room, Slippers, Satellite Channels, Laptop safe, Flat-screen TV, Sofa, Electric kettle, iPod dock, Private pool, Wardrobe/Closet, Bidet, iPad, Sea view, Hypoallergenic, Coffee machine, Terrace, Towels, Linen, Outdoor furniture, Outdoor dining area, Clothes rack. Athiri Serves on A la carte menu, no matter what time of the day our buffet breakfast offers choice of cooked breakfasts, of different types giving you the perfect start of your day. daily cuisines are available as you wish , including Athiris Pizzas fresh from the wood-fired oven. or just sit by the beach watching the sun go down while we serve you Athiri specialties we have prepared specially for you. Avi – Pool Bar – a casual pool at day time and a colorful cocktail bar at night, where special care is given to all guests. Relax and enjoy your drinks by the beach, under the stars while you dance away with the sound of the waves, forget your worries have fun and party till you drop in one of the most private beach resorts in Maldives, indeed Avi is the perfect place to spend your night in this Velaa private island hotel. Wine Cellar – Most Luxurious and largest wine cellar in the Maldives island resorts, with over more than five hundred bins, the ivory-white Tavaru tower hosts the Cellar, which included boutique wineries to grand marques, we offer our guest the opportunity to discover gems such as the 1956 Domaine de la Romanee Conti “Romanee Conti” rare vintage Salon Champagne, and a centuries old fortifies 1870 Blandy’s “Verdhelho Solera” the list goes on with the most unearthed treasures from around the world. Aragu – Modern European Cuisine – Served carefully chosen, organic food produced around the world, Chef Gaushan de Silva has come up with an innovative twist of the Old continent. Classical culinary techniques and Passion for culinary art couples with contemporary ideas is surely a lavish experience we offer at ARAGU. enjoy the best of food in this Maldive resorts. Cru – Champagne Lounge – Savour, the worlds finest and most rare type of champagnes, you will have your guide to get you through tasting and choosing what you desire most. Private Island for Private Holiday Experience.